for the sticky little humans or cat lovers on your holiday list. Hola kitties! Last week I gave you some hacks to help with designing your holiday cards. With that out of the way, you're now looking forward to Black Friday and starting your holiday shopping. 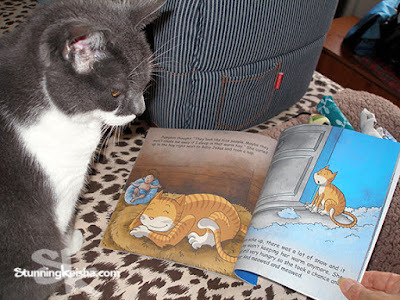 Recently I received a book in the mail that I think should be on everycat's list cos it was written by one of our own in the cat blogging world. I'm talking about "Prancie's Prayer," the first children's book written by Ellen J. Pilch and published by Mirror Publishing. Ellen is staff to the 15 and Meowing kitties and Prancie is one of those kitties. The book is illustrated by Nicolas Cage Peruzzo. This story is a fictionalized version of how Prancie found herself living in her forever castle with Ellen and family. all of that and more in her wonderful forever home. This is a nice Christmas story no matter your beliefs or which religion—if any—you follow. It is one of the most adorable books we've seen. Pilch and Peruzzo combined on a book for the ages. TW read it to me in one sitting and we both applauded the ending. I'm all for kitties finding their forever home no matter how they get there. You can buy Prancie's Prayer on Amazon for $12.99 and the Kindle version is $2.99 or on Barnes & Noble for the same price. Humans on goodreads give it five stars, which is the equivalent to four paws up and they give a full listing of where the book is available. Amazon has free shipping for the holidays no matter how much you spend. Plus, Ellen is donating all the royalties from October-December to Boston's Forgotten Felines, a 501(c)3 non-profit organization, which helps the homeless kitties in that town. That's a very good reason to buy the book sooner rather than later cos who doesn't want to help kitties in need even if they might be Red Sox fans. 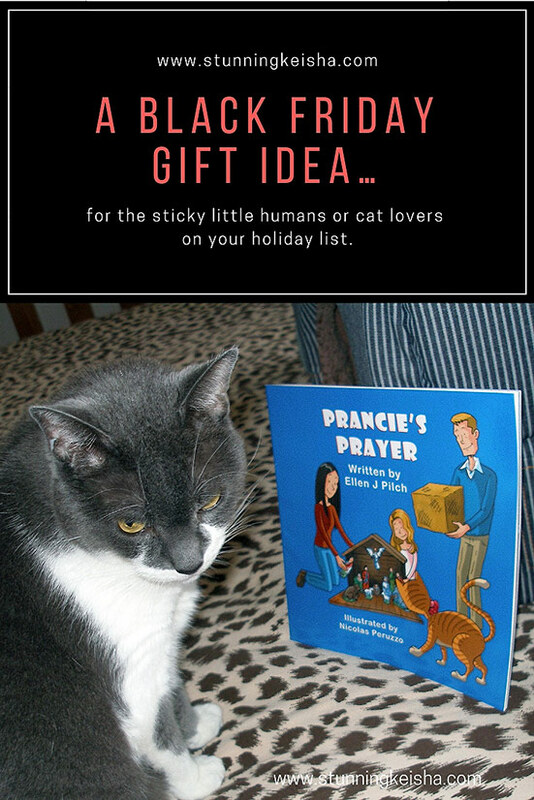 I think "Prancie's Prayer" would make a great stocking stuffer for cat lovers of any age. Disclaimer: I received a free copy of the book with no strings attached. There are NO affiliate links in this post. Even if they might be Red Sox fans . . . MOL! We LOVE this book! We have to do our review soon. You are so right, that would be a most wonderful gift CK! I have the Kindle version and agree, it is a lovely book. The illustrations are adorable. One of our favorite books of the year! This is the purfect gift idea for black Friday this week. 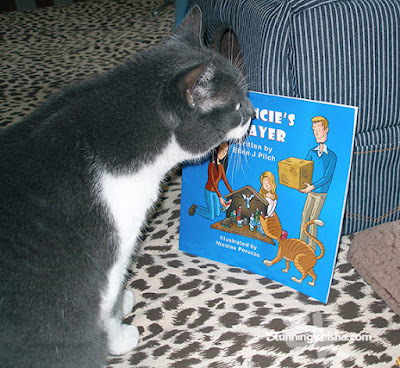 It will be a wonderful gift to cat lovers and to those little kiddies this holiday season. Thanks for sharing the great idea. Have a wonderful holiday week. 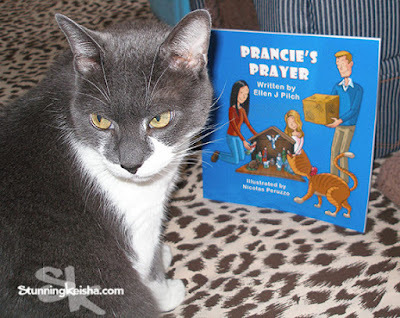 We just don't have any wee kidlets to give Prancie's Prayer too, so that's why we gave our copy to the local library. We love this book too. It's very sweet, plus it's awesome that we know the real life protagonist. It sounds like a delightful story, perfect for any animal lover. I always like giving books as gifts. We haven't gotten our paws on one yet ... but thanks for the reminder to get on that! Oh CK you are so beautiful! Sigh. We just love Prancie's beautiful story. Thank you for spreading the word about this fantastic and festive tale, CK! We bought this book and it's so cute! We agree, it would make a great gift.